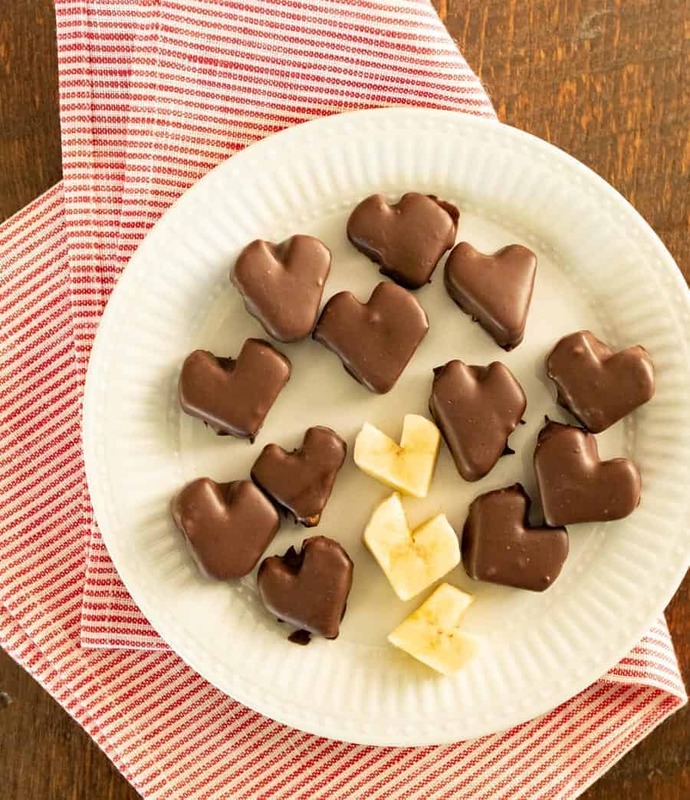 Chocolate-covered banana hearts made with only two ingredients are a great treat for kids to help make and eat. Need a quick easy treat to make with your kids or grandkids? 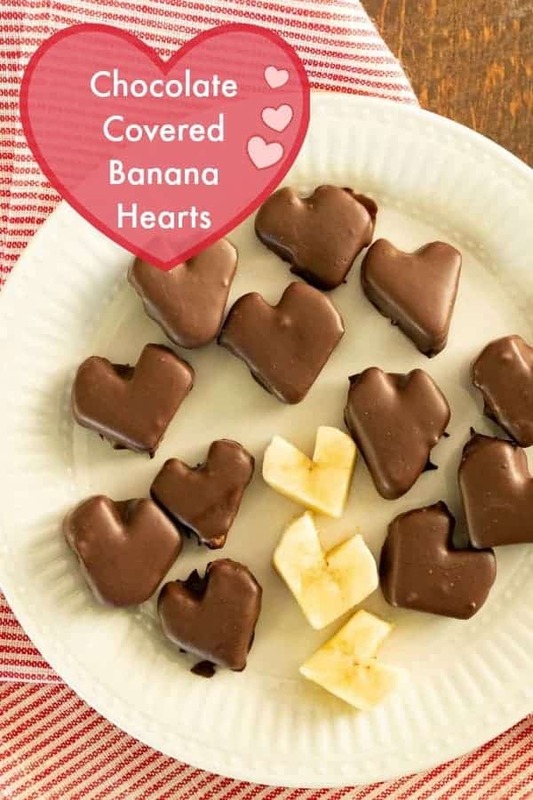 Try chocolate-covered banana hearts! 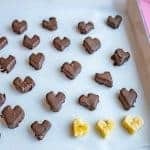 Cutting the bananas into little heart shapes is the perfect task for kids and dipping them in chocolate is a simple way to dress them up (add sprinkles to the chocolate before it sets if you like). When the project is over, you can eat it! I made these a few years ago when I did a co-op preschool with other moms. It was part of our snack to go along with some Valentine’s activities. The kids loved them and I’ve made them a few times a year ever since. They are really delicious frozen, too. Enjoy this simple treat from my kitchen to yours. Bananas are so easy to cut! Get the kids involved, because they can use a butter knife. If your chocolate starts to thicken up while you’re dipping, just melt it a little more. Sometime the moisture form the banana makes the chocolate get thick quickly. I saved all the funny scraps of banana that I had leftover from cutting the heart shapes. I just threw them in a container in my freezer and then tossed them in a smoothie the next day. Can you freeze chocolate covered bananas? Yes! These are just as good frozen or cold as they are at room temperature. They thaw quickly too, so if they are too hard for little mouths, it only takes a few minutes for them to warm up. I hope you make time to make these over the weekend with your kids! 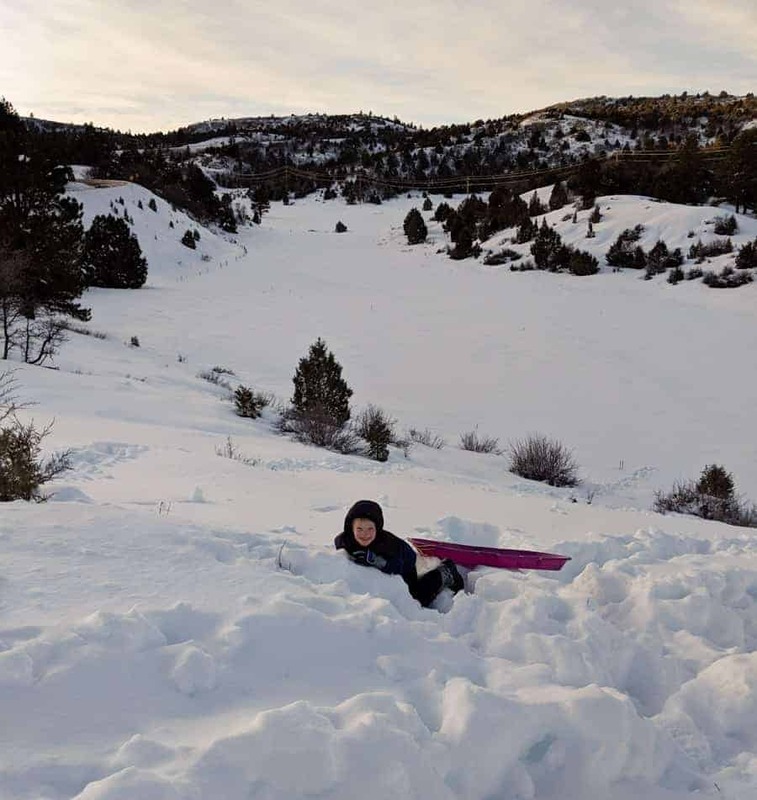 We drove about 15 minutes farther up the mountains a few times in the past few weeks to take the kids sledding. Getting 5 kids dressed, gloved, and ready to sled is so much work but once we get there, they’ll stay for hours! Thomas is the best dad and makes awesome runs, tunnels, and jumps. The snow here was at least 4 feet deep and really hard to get around in. So we tramped down paths and if the kids wanted to get somewhere beyond the path they would roll around and around instead of standing and sinking up to their middles. It was pretty fun to watch. I’ve always loved the water and I don’t even mind if it’s in the form of snow. Those banana’s look amazingly yummy! That was a super cute idea to valentine. Melissa, you are just so talented! Your description on the side doesn’t do your blog and yourself justice, but your pic of yourself is beautiful! You are nice to me. You should write me a new description! It’s so hard to do it for myself – it’s just weird! Please post what Macey said for her answers. Is cleaning still what you are “good” at? yum! how is teaching preschool w/2 other little ones? i’m trying to decide what I want to do w/michael next year. I love doing the group preschool thing! It’s cheap (free! ), it’s fun, and it was a great way for me to meet other women since they started the Monday after we moved into our house! I just plan on Henry helping out and doing everything the kids are doing. If we are doing a craft or worksheet I just make sure to have everything for him too. He loves it even if he is just coloring on the paper while the kids are working on writing. Kimball takes a nap for most of it, and when he isn’t napping he just plays on the floor. The kids love him! It has worked out really well for me and even with having my other kids around. 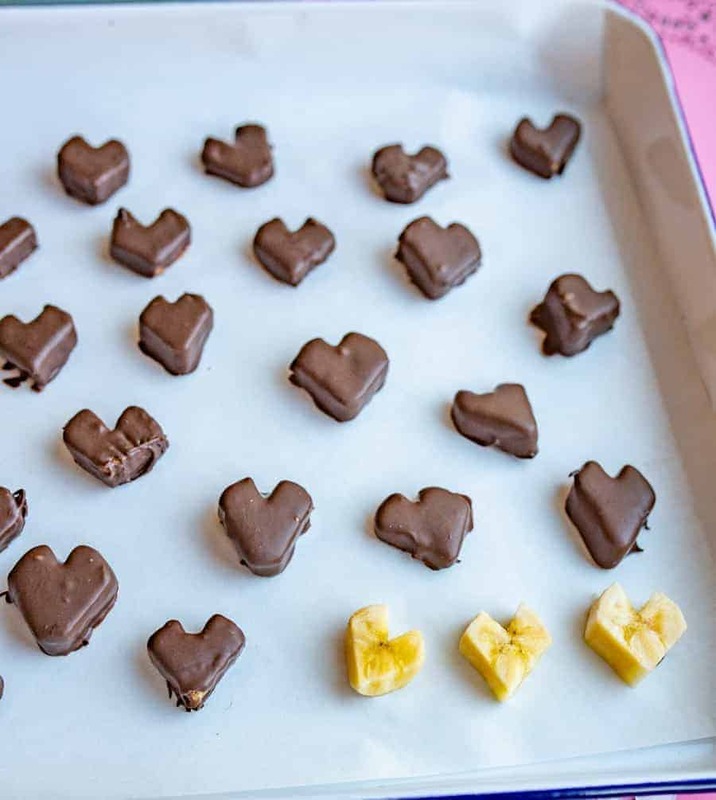 I made these(well I didn’t make the cute heart shapes) a few years ago…..I put them into the freezer and had my own little midnight indulgent snack now and then. Somehow I forgot about them(how?) and they proceeded to get buried like most things do in a freezer. About a month ago I found the bag of a dozen or so….after the house had gone to sleep for the night I happily put them in my belly. They were still awesome! Aren’t they the best! So creamy and simple but real real good!